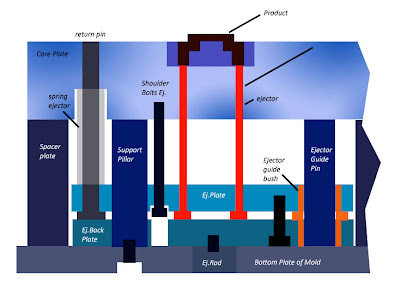 Each type of mold have their own ejector system characteristics, such as : one step ejector, two step ejector, stripper ejector system, pin and blade ejector system, gas ejector, and vacum ejector. from various ejector system that available all of that type have main part or main component. picture below shown common and main component for ejector system. this image size about 700X500 px, click the picture to enlarge. 1. after cavity of mold injected with plastic material, and cooled moldbase will open, and product have to eject from the core insert.see the open condition of molds. rod from injection machine will push the ejector rod,because ejector rod connected to ejector plate, ejector plate will move forward. 3. ejector guide pin will guide those moving, to prevent scratch and guide the moving more easily use ejector guide bush, ejector pin and ejector guide bush will have little friction. 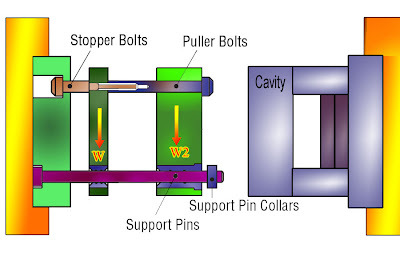 4. ejector pin clamped between two ejector plate, because that ejector pin will also move forward push the product. 5. after product take it out from cavity, mold base will moving close again. 1. Ejector plate, place for ejector and ejector guide bush, shoulder bolts and return pin. 2. Ejector Backing Plate, place for clamping the ejector and push back the ejector. 3. return pin, push the ejector plate and ejector backing plate to first position. 4. spring in return pin, to make sure and holds the ejector plate so it's always in back position, when in assembling process, it can lift up the ejector pin, and ejector plate so the position always in back, give the little preloads to ejector plate to make sure the ejector plate position. 6. ejector pin, eject and push the product from core. 7. ejector guide pin, guide the moving of ejector plate. 8. ejector guide pin bush, to make sliding and prevent large contact when moving. 9. support pillar, to prevent large deflection of core plate when injecting the plastic material process held. 10. ejector rod, contact with rod in injection machine, this also passing force from injection machine to ejector plate. 11. ejector bolts, to tie up between ejector plate and ejector backing plate. 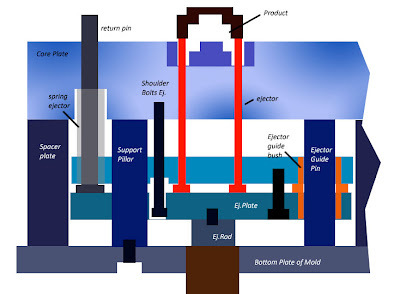 Your Mold information for designer Bcz Very detail & with sketch information provide you. So many many Thanks!! !